Chris Greig was the founding director of the UQ Energy Initiative and is now Director of the Dow Centre for Sustainable Engineering Innovation. He is a Chemical Engineer having obtained his degree and PhD at the University of Queensland and is a Fellow of the Academy of Technological Sciences and Engineering. His career commenced with a successful start-up company that he founded while completing his PhD at UQ. He led that company for 15 years before successfully exiting through its sale in 1999. Prior to joining UQ in 2011, Chris held senior executive roles in the construction, resources and low-carbon energy sectors. He has held various other non-executive directorships with ASX listed companies,was Deputy Chairman of Gladstone Ports Corporation until 2015 and is a current director of the Energy Policy Institute of Australia. 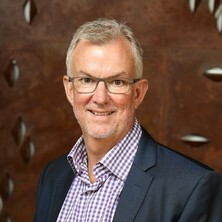 At UQ, in addition to his substantive roles as Director UQ Energy Initiative and now the Dow Centre for Sustainable Engineering Innovation, Chris has served on the Advisory Boards for the Centre for Coal Seam Gas (Chair) and the Queensland Geothermal Energy CoE. He remains a member of Advisory Board of the School of Chemical Engineering and co-leads the Energy Poverty Research Group. Chris's teaching activities include course coordinator for ENGG4900 – Professional Practice in the Business Environment; and ENGY7004 - Energy Finance and Investment. His main research interests lie in Energy Transitions, Techno-Economic Assessment of industrial processes, Energy for Development and Mega-Project Implementation.